The L.A.M.B. 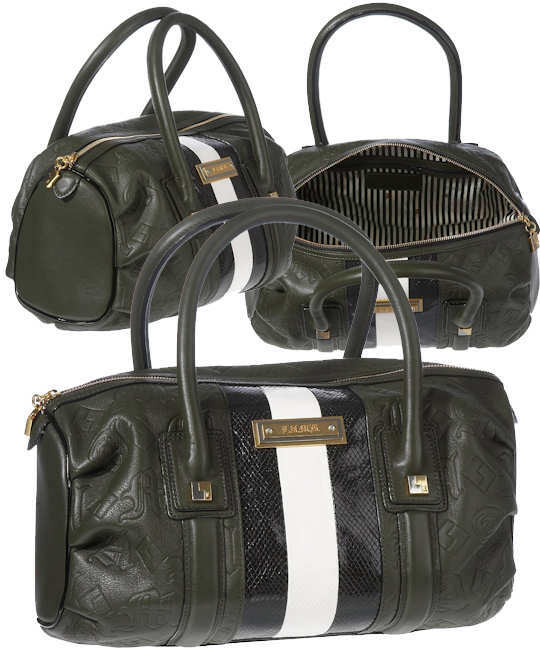 (Lamb) Haswell is a barrel shaped bag made from logo embossed green leather, black patent leather and white leather. On the front of the bag there is a L.A.M.B. logo mounted plaque. The bag has a top zip fastening and two top carry handles. Inside, the lining is stripey and there is one zip pocket and a mobile phone /PDA pocket. Measurements: 13″/33cm (width) x 10″ /25cm (height) x 5 1/2″/14 cm (depth); 4″/10cm handle drop (all measurements are approximate). Style note: Formerly difficult to find in the UK, Gwen Stefani’s range of edgy, uber cool L.A.M.B. handbags are just what you need to perfect your rock chick ensemble. Team with leather jackets, ripped jeans – and attitude. Delivery to UK, Channel Islands and Ireland only.